If you're interested in getting involved with our community, then discover how you can become a member. Welcome to Phoenix Cycling Club. Its very simple to join us. 1. See the types of runs we offer and also find out who the run captains and regular riders are. 3. Ask for Eamon Burns (he’s the man in the white van). Eamon will ensure that you have correct insurance and if not, will sort for you. He also has spare tubes for sale. 4. Make sure you have the correct kit (for the time of year), wear a helmet, bring food (Banana/energy bar etc) + at least 1 water bottle. Winter runs will stop for coffee, but sometimes the runs will only stop for water breaks etc. Bring spare tubes or purchase one from Eamon. 5. Follow the public Phoenix Cycling Club Facebook page or follow us on Twitter. 6. 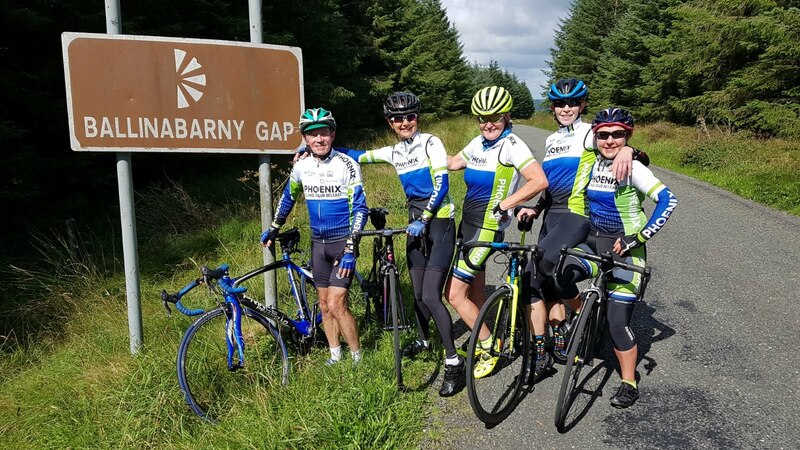 Anyone can turn up for a spin to test the water, however, if you like what you see and you want to become a full member of Phoenix, then speak to Brendan McCartan (Club Secretary) who will advise you on how to become a member of Cycling Ireland (everyone needs to join). Once you are a member Brendan will claim you as a Phoenix member and charge you an annual membership fee of £20. 7. Once you are an official member you will be able to purchase the club kit, join the WhatsApp run groups and be provided access to the official Phoenix Facebook club member Facebook group. Phoenix CC is a large club serving the wider Belfast area. We are one of the biggest and oldest cycling clubs in the British Isles participating in all forms of cycling. Having such a large membership has caused some communication problems for us in reaching all our members. This website (www.phoenixcc.net) is the most important tool we possess to relay information to the membership, so please take some time to familiarise yourself with the layout and content. The most important section is the message board and the section “General Board”. This is where all up to the minute club information about events and what is happening is stored. Under “contacts” you will find details of your committee should you want to contact them. The club is regularly active in most forms of cycling and our main weekly activity is our Saturday morning club run from the House of Sport leaving at 9.30. For most members the weekly Saturday and Sunday club runs leaving from the House of Sport at 0930 is their main club activity. On Saturdays (the more popular day) up to 80 riders leave to cover various distances at different speeds. Usually 5 runs leave, distances range from 35 miles to 75 miles with the fastest run averaging 20mph and the slowest run about 14 mph, so there is something for everyone. Please come along, you will be made to feel very welcome. A number of members compete in local road races during the summer months as well as our weekly Tuesday night club handicap races that are run on a league basis to find our club league champion. We have a fast growing off road section which meets in the winter on a Tuesday night for a run around the parkland adjacent to the river Lagan. These are led by Jonnie Bogues, who can be contacted on john.bogues@talk21.com, for more information. Some club members also participate in cyclocross and MTB racing during autumn, spring and summer. Leisure cycling is all about enjoying your bike and great company. It can be on or off road, though in Phoenix it is mainly road based. The venues can be on our doorstep, although in recent years more and more cyclists from the club are travelling to Majorca, the Alps and the Pyrenees to indulge themselves in their favourite sport. The club is pleased to have as sponsors Traction Finance, McConvey Cycles and Gerard Maguire Solicitors. Discounts are available to members at McConveys on production of your club membership card.